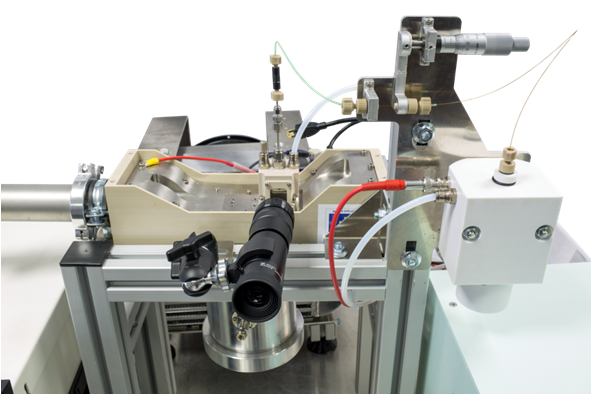 SEADM’s Tandem Differential Mobility Analyzer (TDMA) enables to study a wide range of nano-aerosol processes by analyzing the change of electrical mobility experienced by the nanoparticles. Figure 1: Schematic of the TDMA with electrometer detection (FCE). Note how the process of study takes place in between the two DMAs. Electrical mobility is a well-proved method to elucidate structural and size characteristics of ions, and has been successfully applied for the study of processes such as evaporation, condensation, chemical reactions, charge reduction (or charge evaporation), nucleation, etc. TDMA features the renowned DMAs first developed by SEADMs cofounder, Prof. Juan Fernandez de la Mora, from Yale, including an ultra-high resolution, high transmission parallel plate DMA (termed DMA P5 system) before the process chamber, and a suitably lighter cylindrical DMA (termed Half Mini) afterwards. The system (Fig. 1) produces particularly rich information when exploited to investigate molecular ions or small clusters, since particle diameter is in this case discrete, and a series of well defined peaks rather than a continuum mobility spectrum is obtained. 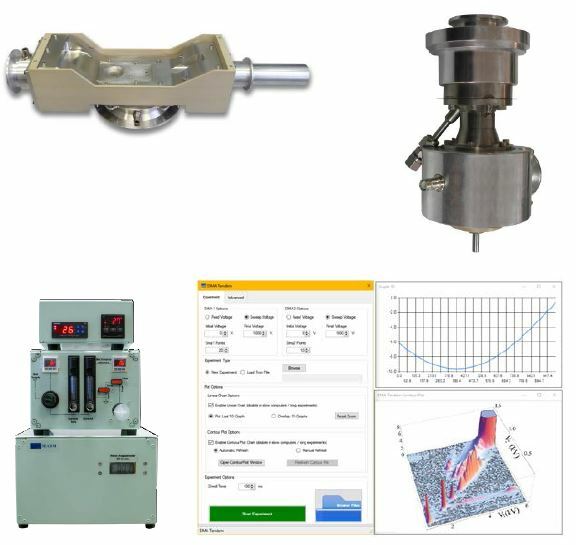 Supercritical high flow (Re>>2000) allow high resolution: 80 and 30 peak voltage/FWMH for DMAs #1 and #2, respectively. Planar DMA P5 (DMA 1) allows direct introduction of nanoparticles at its inlet and a significantly reduction of space charge problem. DMA P5, likewise, enables operating at high initial concentration or high temperatures. Sheath air in DMA P5 achieves interruption of kinetic processes without dilution of the particle sample. Conveniently lower cost Half Mini DMA is provided as DMA2. Tandem DMA generation of strictly monomial 1-3.5 nm particle standards. Charge evaporation from nanometer polystyrene aerosols.